Nestled next to Burma, Laos and Vietnam, Yunnan is China's most varied province, with the nation's greatest number of flora (18,000 high-plant species), fauna (1,836 vertebrate species) and ethnic minorities (25 recognized groups). But it is the southwestern province's mycological diversity (850 species of edible mushroom) that most excites gourmets. Whole streets in the provincial capital of Kunming are taken up by restaurants specializing in mushroom cuisine. The selections on offer usually include meaty porcini, beloved in Italy; chanterelles and morels, prizes of French haute cuisine; matsutake, a piney fungus favored in Japan; and a sizable though less intense type of black truffle. There are also hundreds of other varieties found only in Yunnan. In Mandarin, many of the mushrooms have names that reflect their meaty bite, like "taste-of-chicken mushroom" and "ox-liver mushroom." A hotpot is the traditional Yunnanese way to savor the fungal cornucopia. Often flavored with local ham, the broth gets richer with each mushroom that steeps in it. Porcini and green-pepper stir-fries are popular too, as are fungus salads, zingy with garlic, black vinegar and wild herbs. The best time to partake is when the rains fall on Yunnan from May to September. 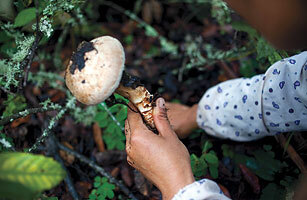 Dedicated foragers can collect their own mushrooms deep in the hills, where ethnic Tibetan communities live. Some former yak herders now make their livelihood from mushrooms, which are mainly exported to Japan and Europe. Others supply a domestic market that is hungry for medicinal fungi, like cordyceps, also known as caterpillar fungus, which are believed to have aphrodisiac and energizing properties. Magic mushrooms indeed. See "TIME's Summer Journey: We Are What We Eat."